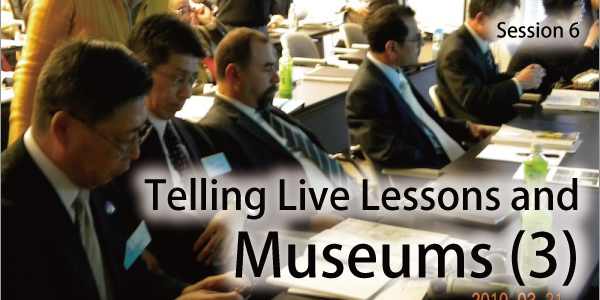 Envisioning the role of museums in preserving and disseminating the real live stories and lessons from the experiences of disaster response, recovery and reconstruction in the aftermath of earthquakes and volcano eruptions. B.E. in Education (1982) from Okayama University, worked in Kobe commercial high school(1982-1994) and Maiko high school (1994-present). The environment and disaster mitigation course started at Maiko High School in April 2002 (Environment and Disaster Mitigation Coursechairman: 2002-present). The purpose to start the environment and disaster mitigation course is to send the lssons we learned from the Great Hanshin-Awaji Disaster to the world and make the citizens aware and prepared to cope with disasters. The literacy consists of three factors: the fundamental knowlege and the fundamental skills to cope with the disasters, and the strong will to contribute to the society. Taiwan is located at the Eurasian plate and Philippine Sea plate on the suture zone. The Taipei weather seismograph was installed in the beginning of the Japanese occupation period in 1897. Up until 2009, Taiwan has encountered ten major earthquakes. The Chi-Chi Earthquake in 1999 (also called 921 earthquake), brought more loss and damage of life and property than most significant earthquakes over a hundred years. The 921 Earthquake Museum of Taiwan has several missions, including commemoration of the earthquake, reflection of the earthquake, education of earthquake science and disaster prevention, preservation of the disastrous site, and collections of relics, documents, and historical facts of the earthquake. In order to achieve these goals, several buildings have been established. One building houses and preserves a real fault line, named the Chelungpu Fault Gallery. Moreover, Earthquake Engineering Gallery, Imaging Gallery, Disaster Prevention Gallery and Reconstruction Gallery were also built. On another level, the museum has a goal to progressively enrich the awareness of earthquakes by employing scientific and disaster prevention education in the way of special exhibitions and hands-on exercises and activities. The 921 Earthquake Museum actively promotes its vision in Taiwan and the world to implement the concept of disaster prevention and disaster relief to save lives and enhance our community’s capacity to respond to future earthquakes. Armenian Association for Earthquake Engineering (AAEE) was established in 1998 and was registered by the Ministry of Justice of Armenia in 1999. In the year 2000 AAEE became a member of IAEE and in 2002 a member of EAEE. 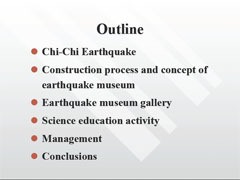 The first large project of AAEE was the establishment of a Museum and a permanently acting Exhibition on the achievements in the field of earthquake engineering in November 2002. The destructive consequences of the 1988 Spitak Earthquake are well known ? more than 25,000 people killed and more than 500,000 people remained homeless. Thus, it is necessary first to always remember what had happened and who had extended help to Armenia for reconstruction of the Earthquake Zone, and second to draw lessons, as well as to educate the population for acquisition and further improvement of its seismic literacy. The happened tragedy showed that underestimation of this inescapable natural phenomenon leads to consequences, which turn back the development of the country for decades. This takes place, when the world experience in assessment of seismic hazard and risk and protection against it is ignored. Every member of the society should know what kind of hazard is in store for him and how he can help himself and others in case of an earthquake. By creating his dwelling or his working place without the necessary base of knowledge, a person exposes himself and others, as well as his progeny, to a mortal danger conditioned by forthcoming earthquakes. One should not live for the day only and think, that the earthquake would hit somewhere far away from him. Because of lack of education in the areas of earthquake engineering and disaster management people continue to build their habitation in absolutely inadequate ways towards the real seismic hazard. The Museum and Exhibition became a source of knowledge, education and information for people from various strata of society and of different ages. Mikayel Melkumyan is a Doctor of Engineering Sciences. He is a Research Professor in the College of Engineering at the American University of Armenia. In 1990-1991 he conducted joint scientific-research work in the laboratory of Professor Okada in the Institute of Industrial Science (IIS), University of Tokyo, Japan. 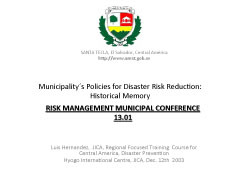 Since 1990 he is a Foreign member of the Research Center of Seismic Resistant Structures of IIS. In 1995-1996 he developed 2 unique methods of upgrading earthquake resistance of existing buildings without interruption of the use of the buildings by means of base isolation and isolated upper floor (his method on retrofitting by base isolation has already been implemented in Armenia and Russia and retrofitting design developed by him has been submitted for implementation in Romania). Since 1997 he is the Vice-President of the International Association of CIS Countries on Base Isolation. 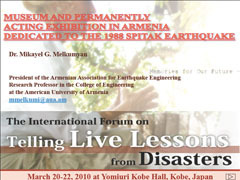 Since 1998 he is the President of the Armenian Association for Earthquake Engineering and since 2001 he is a Founding Member of the Anti-Seismic Systems International Society (ASSISi). Also he is a Member of the European Association for Structural Dynamics, a Corresponding Member of the Armenian Academy of Engineering, a Member of the European Association for the Control of Structures, a Supporting member of the International Council for Research and Innovation in Building and Construction (CIB) Working Commission WC114 “Earthquake Engineering and Buildings”, a Supporting member of the CIB Task Group TG75 “Engineering Studies on Traditional Constructions”, the Chairman of the TC 7 (CEN/TC 340) “Anti-seismic devices” Armenian National Technical Commission under the same name European Committee for Standardization CEN/TC 340. Mikayel Melkumyan is author/co-author of more than 170 scientific papers, including 12 books and 12 inventions/patents. The Kanbara Kan-non-do Temple tells the tragedy of “15 steps that made the difference between life and death in the Tenmei Era.” Excavations started in 1979 brought back part of the village of Kanbara of 1783. The village was buried in 6 m of mud from the eruption of Mt. Asama, which killed 477 people. Nevertheless, with the help of neighboring villages, the 93 people who escaped to Kan-non-do Temple and other places on high ground rebuilt a new green-rich village on top of the former village where their ancestors slept. The mudflows swallowed the basin between the Agatsuma River and Tone River, claiming the lives of 1,490 persons in 37 villages. For the ensuing two centuries, the locals have continued to talk about the disaster and recovery without ever forgetting. 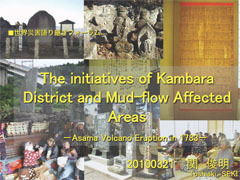 I will introduce an example of a memorial service in the Kanbara area and a few points in the mudflow disaster zone, and confirm elements of a community that has preserved its disaster history and elaborate on a vision of mine. Toshiaki Seki was involved with the 1783 Asama Eruption via excavations into sites in the disaster area. As a resident of the said area, he is interested in developing a vision of an outdoor museum for passing down events of the past (tentative name: “Japan’s Pompei”). 1996- 2005: Worked for the Gunma Archeological Research Foundation. 2002: Participated in the 10th excavations of Pompei, Italy by the Paleological Association of Japan. 2004-05: Member of the “Expert Panel on Passing Down Disaster Lessons” of the Central Disaster Prevention Council, Cabinet Office; Member of the Japan Archeological Association; Member of the Local History Research Association. The truth of the disaster and the activities of victims are recording from a sense view of the inhabitants. 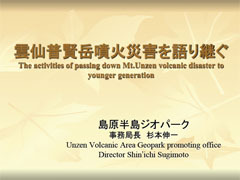 The activities owned jointly with case studies of other volcano for example, Usu Volcano and Miyake-jima Volcano is doing. The activities passed down the experience to younger generation are continuing until now passed twenty years from the eruption. I was doing the activities passed down to visitors and students visited on a school excursion.